The problem is lulzbot doesn't have any in Stock atm, I ordered a board from ultimaker (or whatever the place is that sells them) not realising there's a difference seems as though the only thing missing is the power connection to the second extruder. Not a problem I don't use the second extruder and can solder in the pins if I ever need to. Question is if I flash the rambo v1.3 with the script in the lulzbot board documentation. Everything should run fine shouldn't it? Or is the rambo 1.3 different in some way I cannot see from the 1.3l that it won't work correctly. The board that is installed in the Taz 6 is a RAMBo 1.3L that we source from Ultimachine so there shouldn't be any differences between the RAMBo 1.3L from them and the RAMBo 1.3L that you would have gotten from us. Could you post some photos of the missing port? Once you flash the firmware for your printer setup onto the RAMBo it should be fully functional, but the fact that there may be a missing connector makes me curious if maybe the board sustained shipping damage so it would probably be safer to post the photos of the new board before flashing it so we can look it over for potential damage. 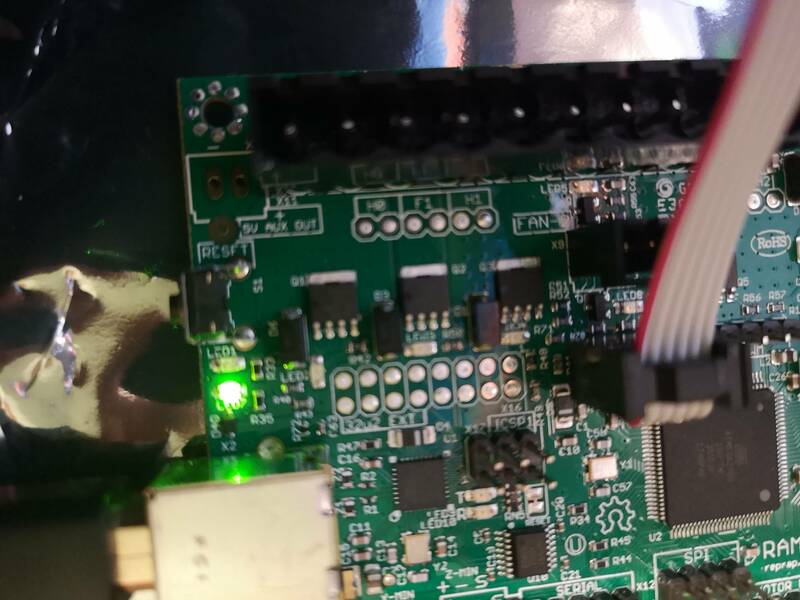 The connector im talking about is where the two holes in the top left corner of the picture, im attempting to flash the board atm but having trouble finding the "shell script" i think that's the hex to the boot loader. I noticed that you said i just had to flash the firmware ended up getting that on the board currently installing the board in the taz 6. So i have the new board connected and running, heres the perplexing thing... the same exact problem is happening with the new board. when i swap the extruder stepper to the y stepper it works its like the stepper is bad. it must be the power running to the stepper but i don't have the board schematics to see where the power for that part of the board is actually coming from. So it wasn't a total waste and i actually ended up fixing all the extruder issues i had. Before i believed the extruder port on the board was bad i had problems with the stepper not getting enough energy, failure to feed after a few layers, and a clicking sound coming from the stepper. which is why i thought the connection finally broke when the stepper wasn't functioning. Bummer that you ended up not totally needing the board but at least it wasn't a total waste! After a closer inspection of the board on the Ultimachine website it looks like they don't add that pin out onto the RAMBo, sorry about the confusion on that.